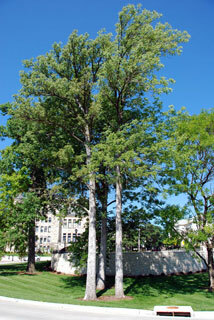 Trunks: Long, with high branches. Crown narrow. Bark light gray, thin with shallow furrows, ridges narrow, flat-topped, irregular. Twigs: Grayish-brown, strongly 4-angled (square in cross-section), glabrous or finely pubescent, angles often with narrow, corky wings. Lenticels conspicuous, oval, pale. Leaf scar crescent-shaped, bundle scars in a row. Terminal buds grayish-yellow, egg-shaped to conic, ca. 5 mm, tip blunt, velvety hairy; lateral buds smaller, ca. 3.5 mm. Leaves: Opposite, odd pinnately compound, deciduous, 15 to 25 cm; petiole 4 to 6 cm, glabrous or minutely hairy; leaflets 7-11, terminal petiole 1 to 2 cm, lateral leaflets sessile or short-stalked, leaflets lanceolate to narrowly ovate, 5 to 12 cm long, 2-5 cm wide, base wedge-shaped to rounded, unequal, margins toothed, tip acuminate and often sickle-shaped, upper surface dark green, glabrous, shiny, lower surface paler, somewhat pubescent, especially along veins near base. Flowers: Before leaves. Inflorescences short, compact clusters at base of terminal bud or in leaf axils; flowers perfect; pedicels 2 to 3 mm; calyx minute, reddish, shed soon after flower opens; petals absent; stamens 2; filaments reddish, broad-based; anthers yellowish-brown; ovary green; style short, stigma red, 2-cleft. Fruit: Late July in drooping clusters; pedicels 5 to 7 mm; samaras, brown, narrowly oblong, 2.5 to 3.5 cm long, 6 to 8 mm wide, winged; wing extending full length of seed body, shallow notch at tip of wing; seed body flattened, not well differentiated from the wing. Habitat: Dry, rocky hillsides, open, upland woods, stream banks, ravines; often on calcareous soils. Uses: Early pioneers made a blue dye from the inner bark, which the common name alludes to. Comments: Blus ash is fast growing, drought tolerant, and long-lived. Quandrangulata alludes to the square twigs that often have corky ridges on the four angles. The wood is pale yellow with white sapwood and is hard.